Recently, someone contacted me with a very interesting question. This person had suffered a stroke a year ago and was now confined to a wheelchair, having also lost the use of their left hand. They were previously right-handed. The question was simple: did I think that a person with the use of only one hand could carve? I sent a reply and, after some thought, realised that it may also be of interest to others who are temporarily or permanently in a similar situation. Although I currently have the use of both hands, I have experienced periods when injury has brought such considerations to mind. Can someone with the use of only one hand carve? My answer is a very definite yes! I'd say that the question might be: what would you like to carve and which tools and techniques will enable you to do it? 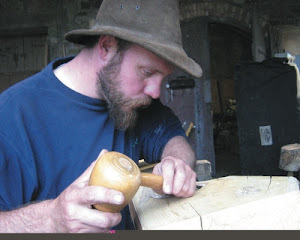 Some techniques could be more difficult (such as using a gouge and mallet) but many tools are traditionally used one-handed anyway. Carvers in many parts of the world (including Africa and the North-West Pacific Coast of the US and Canada) have been creating huge, stunning pieces such as totem poles for many centuries by using adzes swung with one hand to do much of the work. 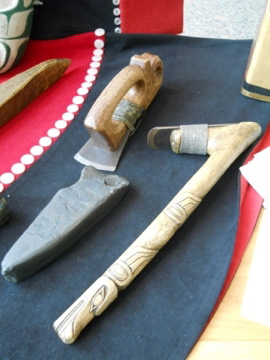 Two types of adze used by First Nations carvers in Canada are shown here, to the right and also above the stone tool. Adzes require a bit of practise to wield accurately and can be quite hard work to carve with for long periods of time if you aren't used to using one. However, they are fundamental tools for carvers all over the world and were also a vital piece of kit for most carvers and other woodworkers in Europe for many centuries. Reciprocating (aka power) carvers are available that can be used one-handed. They are a bit like an electric bread knife that a gouge or chisel blade fits into the end of, which then moves back and forth very quickly to enable easy cutting. I have one made by Bosch and I believe that Wecheer, Axminster and Proxxon also make them. They would be very useful for large and medium sized carvings. Blades made by Flexcut can be used with some of them by utilising adapters - some people find the range of Flexcut blades a bit more delicate and useful for carving with. If these tools are of interest to you, I'd really recommend buying an anti-vibration glove at the same time, as the vibrations when using these power carvers can be quite strong and could lead to 'white finger' nerve damage over time. For smaller scale work, I'd investigate rotary tools such as a Dremel or Foredom tools. They are like small drills that can be fitted with various shapes of cutter, including diamond ones for working on metal and stone. They can also be fitted with long, flexible shafts to enable more delicate handling of the cutters. Another range of tools worth looking at would be palm gouges and chisels. They have rounded handles that sit comfortably in the palm of one hand and aren't used with a mallet, so could be ideal. Very good ones are made by the Swiss company Pfeil. They aren't cheap, but they are usually excellent quality and are available in Britain. 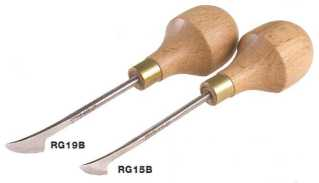 Some tools are also sold with a choice of either traditional handles or palm handles, such as the 'RayGonzales hook skew' made by Ashley Iles which is one of my go-to tools for many fine carving cuts. One question that will need thinking about is how work pieces will be held. 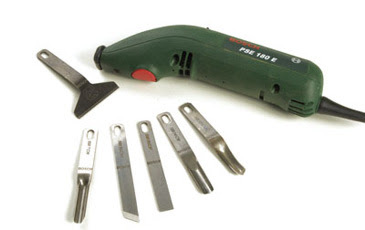 As long as the workpiece is securely held all kinds of tools can be used on it, even a simple pocket knife. To be honest, it's the same question that any carver faces regularly when working on fiddly or awkwardly-shaped pieces! I'd suggest having a range of clamps, vices, wooden blocks and simple home-made frames that can be used in different combinations to hold work. 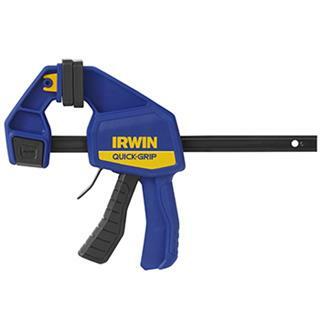 One-handed 'quick' clamps similar to this one would be useful. 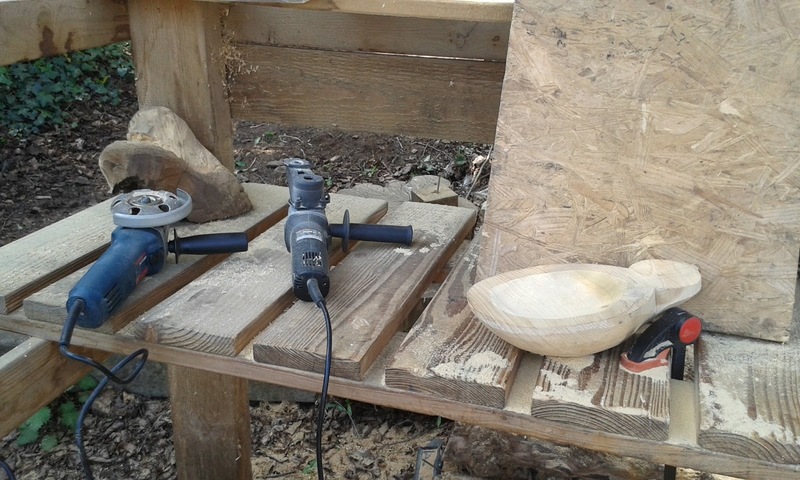 They can be used relatively easily with one hand, but can easily work loose with repeated vibration from carving work so might need regular retightening. G-shaped cramps (a cramp works with a screw mechanism, a clamp doesn't) hold work more securely, but could perhaps be more fiddly to fit on when only using one hand. An interesting, simple method for holding sticks to be whittled is shown on this blog. What you need will depend entirely on what you're making, so perhaps start trying to make things with an experimental and adaptable mindset and evolve methods to hold your work as you go along. One place not to hold work is on your lap - slipping with the blade and hitting one of the arteries running inside your thigh wouldn't be a great way to finish your carving! Another place to get further info might be through the local occupational therapy unit. They may well have ideas for techniques and devices that could be adapted or repurposed to enable easier carving. I hope that this information is useful to you and encourages you to give carving a go if you are considering trying it and have the use of one hand only. If you have experienced carving one-handed and would like to comment or add to what has been written here, please do. I'd be very interested to hear other thoughts and ideas. If you do decide to have a go at carving and make something that you feel happy to share, please feel free to send me an image. I'd love to see what you create! Last year, I was commissioned to make this award for the Penny Brohn UK cancer charity. It was a real pleasure to be asked to do the same this year. The award was to be presented to Jo Malone MBE, who is well-known for creating perfumes and fragrances. I used timber from a cedar tree that was cut down in the grounds of the charity's offices in Bristol, which was an off-cut left over after making the 2016 award. The award was designed to be the kind of thing that Jo would like to have. Apparently she is a very practical person, so it made sense to produce an award that would have a practical use. A bowl seemed ideal, as it can be both beautiful and useful. The shape was inspired by the leaf of a pomelo, which is the key scent note in Jo's new line of 'Jo Loves' fragrances. 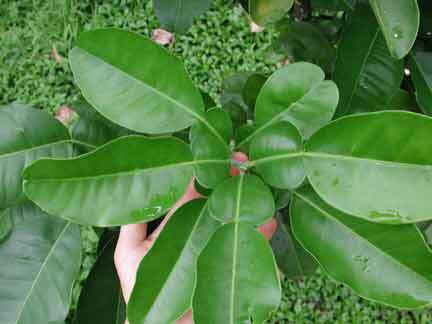 These leaves are quite distinctive, having secondary leaflets coming off the petiole (the stem of the leaf). It seemed appropriate to use cedar wood to make the bowl for a person who works with scents, as the wood has such a distinctive smell of its own. 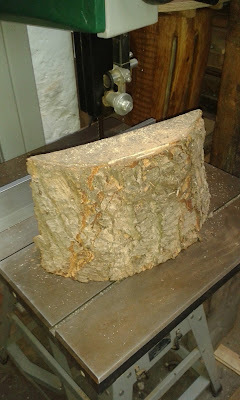 Most of the shaping was done with power tools, for speed and also because I find that power tools often give a better result when working with softwoods such as cedar. 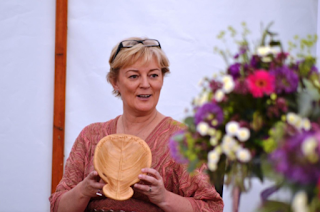 The words carved onto the bowl - 'Passion, Resilience and Creativity' - were chosen by someone who works closely with Jo, as they were felt to be particularly important to her.